We currently have an amazing architecturally designed, custom built home listed for sale on South Harbor Island in Wrightville Beach. This 4 bedroom and 4 1/2 bath property, located in Shore Acres, offers high quality craftsmanship, a contemporary floor plan, and reclaimed Cape Fear River wood flooring in the living room, kitchen, and stair treads. Plus, the property has a beautiful outdoor lighting and trim package, dumbwaiter access at all levels, stainless steel appliances, and native landscaping elements including cedar and palm trees. The property is currently listed at $1,249,000. Here are the directions to the home: Cross Wrightsville Beach drawbridge. Stay right on Causeway Dr / East 76. House will be on right immediately before Banks Channel bridge. Behind Hardee Hunt & Williams office on Auditorium Circle. 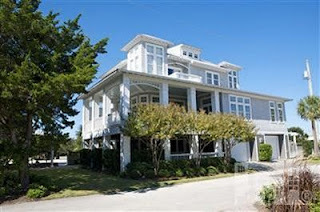 Please let us know if you would like more information on this beautiful home or any other properties for sale on Wrightsville Beach and Harbor Island.